1) Mutineer Magazine: How has the Sacramento cocktail scene changed over the last few years? Chris Tucker: Starting in about 2007-08, the cocktail scene in the Sacramento area was just getting its footing with 4-5 bars featuring handcrafted cocktails and fresh squeezed juices. Since the first Midtown Cocktail Week in 2008, the number of craft cocktail bars has tripled, if not quadrupled, in just the midtown/downtown area alone, with area restaurants also realizing the need for improved cocktail lists and an increase in overall skills/knowledge for the bar staff. 2) What excited you about in terms of how it has developed and where it is going? Last year, Sacramento established its own USBG Chapter. With now over 50+ active members, you can walk into most bars and restaurants in Sacramento and find people behind the bar with either renewed or newly found passion and applying that to some delicious libations. This is particularly true of the downtown and midtown areas of Sacramento, where MCW and the Sac BG has had its strongest impact. With the influence of MCW and how Sac BG has helped to shape the other 51 weeks of the year, I see outlying areas starting to come into their own. We’ve already seen it in pockets of Roseville, Folsom and now across the river in West Sacramento. 3) How has the industry embraced Midtown Cocktail Week? Sacramento has a reputation of having a strong sense of camaraderie amongst its industry professionals. We eat, drink, and support each others establishments. We hang out and talk shop about new products, the latest cocktail we’re working on, or the last bar we were in and cocktail list we saw while traveling. It’s a very friendly, yet competitive environment, with many of the bars sharing staff with one another. This has led to an overall change in the local industry, bringing regional and now national attention to what we are all proud to say is a strong cocktail culture in Sacramento. 4) How many years has Hook & Ladder been involved with Midtown Cocktail Week? We opened in October of 2012, so this will be Hook & Ladder’s first year participating in MCW. We just missed being involved last year. One of our co-owners, Kimio Bazett, and I have served on the Executive Committee for MCW since its inception and our sister bar, The Golden Bear, has hosted an MCW event every year. We are very excited about finally being able to showcase Hook & Ladder during MCW. 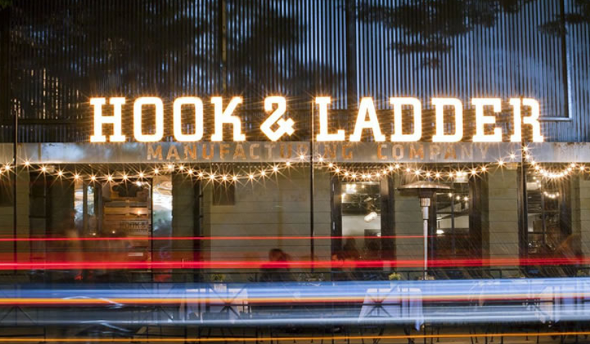 5) How will Hook & Ladder be involved with this year’s Midtown Cocktail Week? On Thursday night, Aug 22nd, Hook & Ladder will be hosting the Kabuki Show, a night of Japanese Culture and Cocktails featuring Sake, Sake cocktails, Japanese beer, Japanese whisky, a Taiko drum performance and small bites among other things. The Japanese cocktail culture features bright colors, big flavors and beautiful garnishes. In conjunction with our feature event, we will also be hosting a limited seat Kaiseki pop-up dinner in our new upstairs private dining room. The menu is a collaboration between our own Chef Brian Mizner and Chef/owner Billy Ngo of Kru. The multi course dinner will also feature the Hakushu, Hibiki and Yamazaki whiskies of Suntory. And on Saturday afternoon, new Sebastopol distillery Spirit Works will be hosting a pop-up patio party commemorating their launch and hopefully the release of their Sloe Gin. 6) What are you looking forward to in terms of this year’s events? Having the opportunity to be involved with the planning and development of the overall week, I’m excited about the uniqueness and diversity of events and pop-ups this year. That competitive creativity is resulting in our biggest and most anticipated year, yet. The class lineup for Thursday and Friday has some heavy hitters coming to town with David Wondrich, Amy Stewart, Bridget Albert, Neyah White and Martin Cate all hosting seminars. The cocktail competition at Low Brau followed by the rookie pop-up competition at The Golden Bear on Wednesday night is going to be a blast. Expect some friendly hazing for the rookie competition. Thursday, Friday and Saturday nights MCW takes the party to the public with our Kabuki Show, The Best Dam Show at The Grange and The West End Art Show at Blackbird. I gotta be sure to save a little in the tank for Red Rabbit’s Best in Show wrap up party on Sunday!